Dedicated to Bharat Joyent's (a.k.a. India Jones) passion for travel and his love for fine cuisine, India Jones serves authentic recipes from Vietnam, Singapore, Hong Kong, Malaysia, Indonesia and Japan. Amongst its many accolades, the restaurant was included in the prestigious Miele Guide 2013 - Asia's first authoritative and independent guide to Mumbai’s finest restaurants. 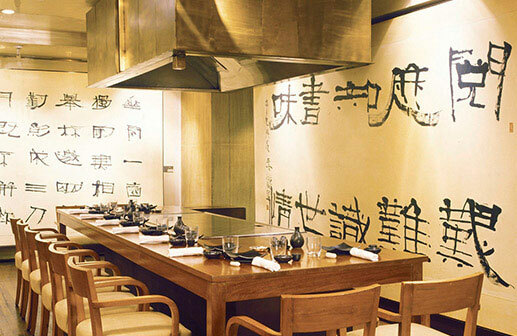 A teppenyaki meal here is a culinary delight and a regaling performance that you are sure to enjoy. Take your time to enjoy a grand appetizer or main course platter with family, friends or business associates. Enjoy a satisfying Korean set lunch, tangy Asian salads, authentic yakitori, oriental soups, dim sum, noodles, something spicy from our wok range, something piping hot from the Indian clay oven, or choose your own catch from our sea tank and have it cooked just the way you like it. India Jones, our award winning restaurant, is open for lunch and dinner. Lunch - 12.30 p.m. to 2.45 p.m.
Dinner - 7.30 p.m. to 11.45 p.m.
Our signature dish, Vietnamese Mint Laksa is a seafood connoisseur's delight. Fresh fish steamed with mint and herb laksa is delicious and healthy too. Masterchef Attachai Kitisri presents his favourite Thai classics this season. The menu includes spicy soups, tantalising yellow chicken curry and the traditional Massaman curry. The set menus for lunch are delicious and convenient. From unlimited dim sum lunch menus to Teppenyaki set meals or the Korean set lunch menu, there is plenty to choose from.